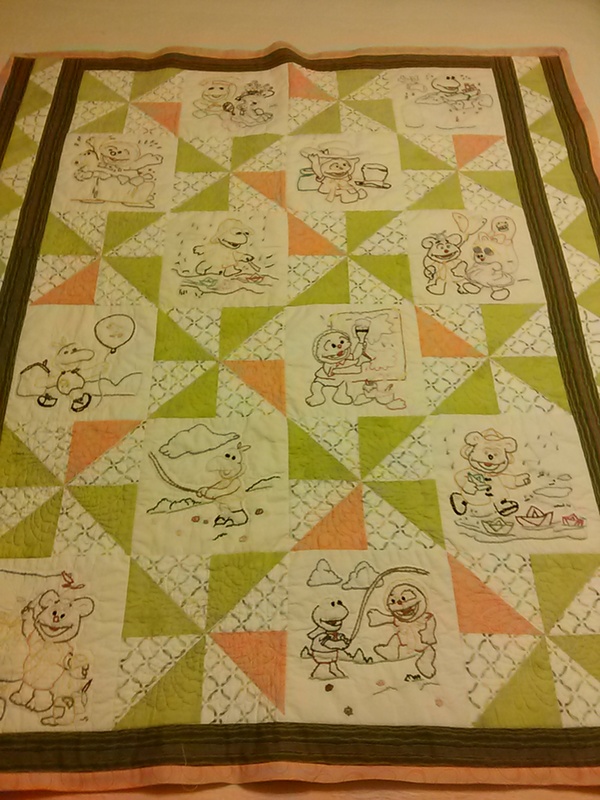 When my daughters were infants, (they are now 30 and 28), their aunt made them each a Muppet Baby quilt. 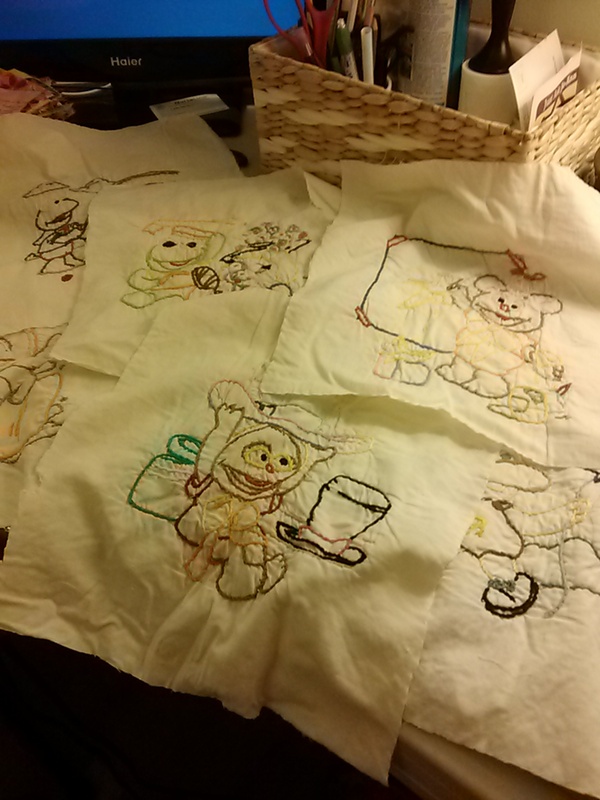 She traced a coloring book page onto fabric and then embroidered the design. She made 16 blocks! After that, she hand stitched the whole quilt, using an old orange wool blanket and grey sheets. On Sunday, my daughter gave me one of the quilts. She had been keeping it for her sister who she thought might actually not take care of it or worse, lose it with all of the moves she's made. The embroidered blocks were in very good condition. Only a couple have holes that need to be patched. The problem is that the fabric was very thin old sheets and I think maybe moths may have gotten to the wool because there where holes in it. It was really not salvageable, except for the blocks which is really fortunate. Anyway, she asked me to 'fix' it. The only thing I thought would work is to completely remove each block and back it with interfacing and sew them into a new quilt using my daughter's favorite colors. Just wondering how the top should be quilted and what kind of batting would be best to use? I could do SITD, but the embroidered blocks are pretty big, maybe 9"x"9 and I don't want to see the blocks separated from the quilt batting and backing. Not sure I explained it, but when it's washed, I think it would look better flat than puffy. Just not sure. Does anyone have any suggestions on the way to quilt the top of this quilt? In order to keep the feel and look of the original quilt, I would be tempted to use wool batting (Hobbs wool is what I would choose). Wool is the elite of quilt battings, easy to hand or machine quilt, and gives good definition without puffiness. I would consider doing a combination of machine and hand quilting. Maybe machine SITD to secure the blocks and hand quilt around (and inside) the embroidered designs. Use fine thread to do a medium-sized background fill in the white spaces around the embroidery. Was there sashing in the original quilt? I would be tempted to add sashing to frame the blocks. If you wanted to just machine quilt, I would echo each design about an 1" to the edges of each block and then SITD around the block. i also would add sashing. I'd also add a border and then quilt the characters names in the border. All I have to say is when you're done with it "Photos, Please?!" Hi -- thanks for the feedback. Yes it did have sashing and borders. I like the idea of SITD and then the shadow quilting around the figures. Thought about that myself. Also, I plan to lightly interface the back of each quilt block because a couple of them have holes to big to ignore. I will go with Hobbs wool. I have another quilt the girls' aunt quilting for me. The theme is the Precious Moments figurines, which she also traced from a coloring book. Rather than the embroidery stitch as on the Muppet Baby blocks, she satin stitched all of the blocks - WOW! I never realized how much work she put into each of these quilts. And they are huge! At least full size. She made the sashings and borders 4" and 6" wide! The Precious Moments quilt it in pristine condition. I am so proud to have these... Will take process pics along the remake of the quilt. Excited to see how it turns out. Last edited by Stitch124; 06-19-2013 at 05:26 AM. The original sashing and border was a very light grey sheeting with a white binding. I think the sheeting was a high thread count because it is very soft and silky to the touch. I'm sure she spent a lot of money for the sheets...at least it was a lot back then. Not too keen on using those same grey and white colors again. Since this is a child's quilt, wondering what fabrics should I use. Solids/prints...etc. Any suggestions? I would probably use good-quality solids. Moda Bella has nice touch quality, and there a couple of other brands that are really good. I don't recommend Kona solids for this purpose because they have a heftier weave that feels more rough to the touch. http://www.fabric.com is one place you can look for these. Prism99 -- Thank you for the suggestion about the Moda Bella solids. I'm getting my toes wet creating quilts from scratch. Picking out color combinations that look good together is not a skill I've learned yet. Just wondering if I need to stick with the gray/white sashing that was on the original quilt or go with bright colors to bring out the stitching on the blocks. That would be my preference...but I do want to stay true to the original quilt that was created. Or is that really necessary. I realize this is a new quilt that I'm remaking, but just wondering if the blocks look old, should the quilt look 'old' too. Not sure I'm explaining this right. You might want to use "30's" fabric between the squares. I would outline quilt around each picture in the squares, then do whatever between the squares. I too am in the process of reworking an old quilt top. It was never completed. But, put together poorly. So I've added new sashing and will proceed from there. I would definitely change the sashing to pick up color from the stitching in the blocks! My bet is the original maker would have done that if she had thought of it (and perhaps if she had had Moda Bella solids available). Muppets do not read 30's to me, so I would not use 30's fabric for sashing. Last edited by Prism99; 06-20-2013 at 10:10 AM. 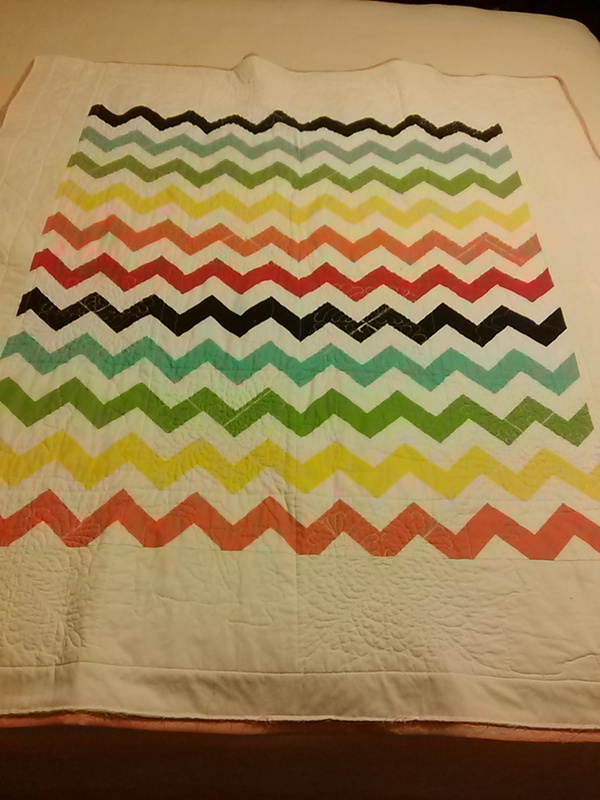 Just thought I'd follow up and share the finished quilt...the pictures as uploaded shows the back of the quilt first which is multi colored chevrons, just because my daughter loves chevrons. So the final result is 2-sided designed quilt. I picked fabric colors for the front and that would bring out the colors of embroidery thread, which doesn't show up on these pictures very well. The orange fabric is a Kaffe Fassett fabric and it's gorgeous. I used it for the binding, which in these pictures I still need to finish doing. The green fabric is a 'stonehenge' like design fabric and is fun too to work with. The light fabric design has those little pin oak tree seedlings that fall off the trees and twirl as they fall to the ground. The design is shaped like a pinwheel too. The embroidery thread used also had a lot of pinks, purples, lavenders, and greens. The dark green border fabric had those same colors but it's hard to get an up close shot of it from these pics, but it really does go with the the other colors to make them pop. The picture isn't very good but it did actually come out very nice. I used a stencil design to quilt in each of the pinwheel blocks. I did outline stitching around each of the embroidered designs to make them pop out off the fabric. I think my daughter will be very pleased and will love knowing that it was made by her aunt and mom 28 years apart! Last edited by Stitch124; 08-09-2013 at 06:18 AM.